Middle Earth? There’s nothing middling about New Zealand’s South Island. For anyone who loves the outdoors, this is a superb destination. Middle Earth? There’s nothing middling about New Zealand’s South Island. This is a superb destination for anyone who loves the outdoors. I had been lucky enough to attend a conference in Christchurch in February, when the Southern hemisphere summer was just beginning to wind down towards Autumn. 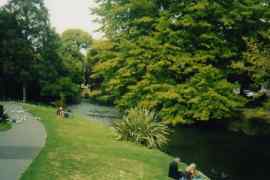 Christchurch — dubbed ‘The Garden City’ — had the feel of a well-heeled English city, a sizeable place, but not bustling. Just to remind us of home, Oxford and Cambridge Terraces lined the River Avon, while Hereford and Salisbury Streets bisected Manchester. The Botanic Gardens were the epicentre of this calm atmosphere, myriad paths leading through collections of native and exotic plants, all with a profusion of colour and scent. Quality restaurants, such as Cook’n’ with Gas, and the Curator’s House abounded, but the lulling ambience could only hold my girlfriend and I for so long. What was the flavour of the rest of the island? It quickly became apparent that the two weeks in a hired car that we had allowed ourselves was only going to be enough to scratch the surface. There was so much to see and do. So, foregoing a thorough coverage of the area and the possibility of tramping for days into the wilderness, we opted for whistle stop visits, some of which (Abel Tasman, and Arthur's Pass, for example), were so short it was almost an insult to their beauty! The gravel-strewn roads were close enough to outdoor adventure sports for us; we soon cracked the windscreen for the first of three separate occasions on our short drive from Christchurch up the coast to Kaikoura. Time for a quick adventure. Large sea creatures don’t exactly abound in British waters (though more so than you might imagine), so we relished the opportunity there to motor out several miles with Whale Watch Kaikoura to see giant sperm whales spouting. They’re pretty good at finding them and we were treated to several sightings of surfacing leviathans. It was going to be difficult to top this on the same day, so we drove on into Marlborough estate country and took the top off a few bottles of wine at Cloudy Bay, one of many wineries in the region. Sauvignon blanc was a classic favourite, but obviously you have to try the full range. Well, you might only be there once! To the west of Marlborough lay the wooded lake lands of Nelson, home to one of an enviable number of national parks. 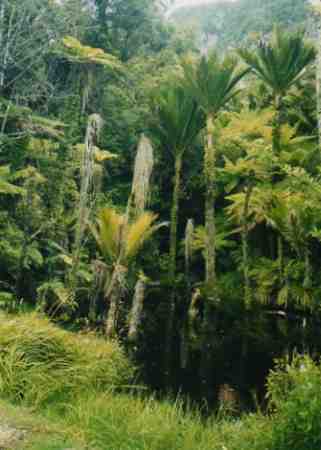 Lake Rotoiti or ‘Little Lake’ provided strolling possibilities on the Peninsula Nature Walk, through tropically warm undergrowth. We were hoping to glimpse the secretive kaka, a forest parrot, but weren’t that lucky. Several wasp traps attested to one of many introduced problems, and since the yellow and black critters are my personal nemesis, I approved wholeheartedly. Up at the northernmost point of the island we reached Farewell Spit. At 25km, this strip of sand and mud sure is a long goodbye, and to reach the end you’d need to join an organised tour on wheels. As we discovered though, there was plenty to see at the landward end, especially the sight on dozens of black swans on a golden beach. That, as so much on this trip, will live with me forever. These warm sands were a sharp contrast to the West coast, where mist-enveloped rocks provided a moody setting. Pitching up in dourly named Greymouth we gazed out in mute understanding at a grey ocean. But if one colour lights up this fairly ordinary town, it’s green, or greenstone to be precise. The Jade Boulder Gallery was not only selling hundreds of polished pieces, but also allowed us to view the raw material and its shaping, which took place in a workshop out back. Time was ticking, and the mighty Fox and Franz Josef glaciers falling into the sea further South had to fall off our list. The Southern Alps were not to be missed entirely however, and we got our slice of ice at Mount Cook. At 3764 metres, the mountain is the highest point in New Zealand, an inevitable consequence being that it is often swathed in cloud. Nonetheless, this made for an impressive visage, as we strode up from the unimaginatively named Mount Cook village. The undemanding Kea Track took us less than three hours return and led to a splendidly bleak view of glacial action. Walls of dirty rock and ice may not be aesthetically stunning, but what they indicate in terms of nature’s power is still breathtaking. If Mount Cook is New Zealand’s ice-rimmed monolith, then Milford Sound is its watery abyss. Most guide books wax lyrical about this fiord land gem, and the cynical amongst us could be forgiven for wondering if the descriptions are a little overblown. They are not. A number of boat companies offer the chance to get out on the water, and passing beneath the sheer mile-high cliffs of Mitre Peak is an unforgettable experience. We were exceedingly fortunately to encounter a place that ranks among the wettest on the planet while the sun shone, on a windless afternoon, but we forsook the world of air for a while and went down into the Underwater observatory. Here, all manner of crustaceans and fish swam in and out of view, or clung firmly to rocks a few metres below the Sound’s surface, all oblivious to our presence. Starfish weren’t the only clinging objects we encountered that day. On the winding road back to Te Anau, we stopped at yet another scenic viewpoint. Several other cars were around, and it hadn’t taken long for the keas to take advantage. These deep green parrots are almost intimidatingly bold, and chunky, and when one starts trying to dismantle the door trim on your hire car, it is instantly apparent that ‘shoo’ probably won’t be enough to evict it. As a Japanese tourist was unwisely risking his fingers feeding another bird a piece of lettuce (they happily eat meat! 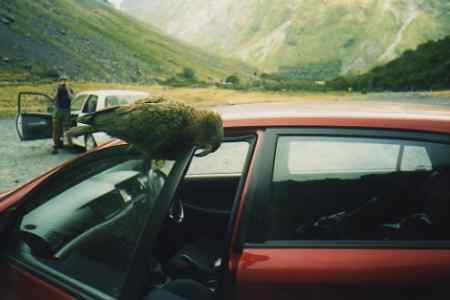 ), we drove off with its mate still scrabbling on the roof of the car. Fortunately when we stopped down the road we weren’t faced with the prospect of returning it, as it had finally abandoned its vehicular antics. Leaving Te Anau, which boasted an impressive captive collection of New Zealand’s native wildlife, we took in a drive on the wild and little visited Southern Scenic Route. All was well as we reached Clifden however, about 150km south of Milford Sound. Having spent many years in Bristol, we felt obliged to inspect their Clifden suspension bridge to determine whether it bore comparison to Brunel’s masterpiece back home. Well, it didn’t really, which is not to demean the wooden structure, which was over 100 years old. Unlike Bristol’s version, this one at least had the bonus of being car free. And train free too. At least one bridge on South Island appeared to be constructed for dual use by car and train, making for a very nervy crossing, the need to avoid getting tyres caught in rail tracks and all thoughts of doing an enforced rapid reverse pushed firmly to the back of the mind! Continuing our tour, we stopped off at McCracken’s Rest overlook, to try and spot dolphins frolicking in the surf; the surf, however, was frenzied and a full-blown gale had arrived, clearly not frolicking weather. We quickly dived back into the car and continued the rugged coastline route all the way around to Dunedin, on the south-east of the island. Perhaps I was missing something, but this ‘Edinburgh of the South’ didn’t really hit the mark with me. True, we didn’t linger long (not unusually! 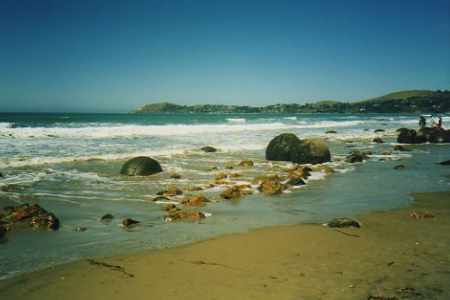 ), deciding that the nearby Otago peninsula was of far greater interest. This strip of land juts out into the Pacific just east of Dunedin. We meandered across grassy dunes, locating a number of warm, sheltered coves on the way, ideal for a spot of snoozing. Leafy Glenfalloch Woodland Garden was worth a stroll, but the pick of the attractions were the penguins. An organised tour of a yellow-eyed penguin colony was a magical experience. Forget the image of a huge circle of birds rotating on an ice floe as a blizzard rages, these penguins were living it up on sun-kissed shores. While the parents were out catching food, the chicks stayed behind, standing with timeless patience, silently awaiting their dinner. Specially constructed tunnels allowed us to pass within inches of these downy youngsters, all totally unfazed by humans being so close, thanks to cunningly-placed trenches and hides. If you enjoyed reading the above article then you will probably also enjoy Altai Republic in Russia by Graeme Down, and the Whitsunday Islands, also in Australasia, and our latest articles covering the Orinoco Delta, La Mata, Marbella and Beijing.